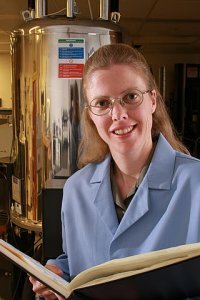 Congratulations to Dr. Wendy Shaw of Pacific Northwest National Laboratory on being one of 31 distinguished young researchers from the United States selected by the National Academy of Sciences to attend the first Indonesian-American Frontiers of Science symposium that took place in Bogor, Indonesia, in July 2011. The U.S. participants, representing universities, government laboratories, and institutions, joined 40 young Indonesian researchers selected by the Indonesian Academy of Sciences. During a poster session, Shaw presented "Enhancing Homogeneous Hydrogen Production and Oxidation Catalysts with a Designed Outer Coordination Sphere." Shaw's work focuses on incorporating the best features of natural catalysts into synthetic materials that can convert energy to fuels, for application to the use of renewable energy. The symposium provided the opportunity to share ideas across disciplines with national and international colleagues. Topics covered included alternative energy supply, biodegradable plastics, climate change, infectious diseases, rapid exploration of marine microbial diversity with metagenomic methods, and rice genomics. The 2012 symposium will take place in Solo, Indonesia.